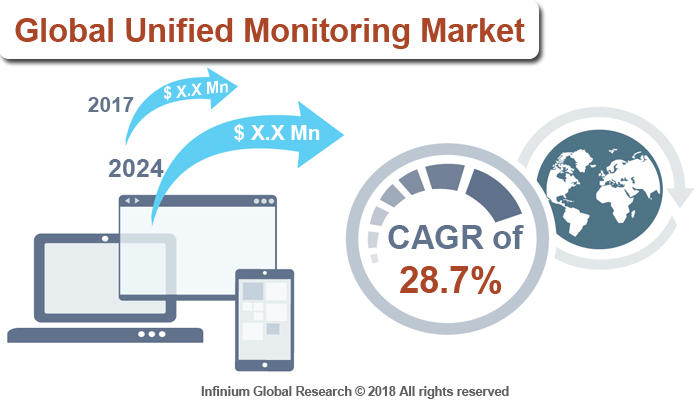 A recent report published by Infinium Global Research on unified monitoring market provides in-depth analysis of segments and sub-segments in the global as well as regional unified monitoring market. The study also highlights the impact of drivers, restraints, and macro indicators on the global and regional unified monitoring market over the short term as well as long term. The report is a comprehensive presentation of trends, forecast and dollar values of global unified monitoring market. According to the report, the global unified monitoring market is projected to grow at a CAGR of 28.7% over the forecast period of 2018-2024. Unified monitoring deals with the monitoring of the entire IT infrastructure, including physical, virtual, and cloud by using an integrated platform. It helps the IT department to gain the incorporated view of their availability and the performance of the application, databases, network, security system, and other devices. In unified monitoring, the data has been collected from different devices. The collected data then combined by using the multiple tools to form the picture of accessibility and the performance of the groundwork into a single pane of glass. During the monitoring of ongoing operations, in the case of problems, the unified monitoring system sends the alert signal to the responsible staff of the problem. This will further reduce the complexity of the system and resolve the problems in the minimum time. Nowadays, nearly every organization is highly dependent on an IT infrastructure to perform daily operations. The adoption of the new IT technologies such as IoT, Big Data and others across various enterprises are rapidly increasing. The growing complexity in the IT infrastructure and their applications are driving the growth of the unified monitoring market. Unified monitoring is provided with intelligent visibility, detection of issues and exclusion of blind spots with a better time and the cost-effectiveness. The unified monitoring offers excellent end-user experience, faster problem detection and resolution, and other benefits. In addition, the rising need of advanced customer experience is anticipated to boost the growth of unified monitoring market. Furthermore, the growing need of a system that effectively manages the security and the performance of the IT infrastructure are contributing to the growth of unified monitoring market. However, the high installation cost is hampering the growth of the unified ministering market. Moreover, the growing adoption of unified monitoring in the small and medium-sized enterprises is projected to create several growth opportunities in the unified monitoring market. Among the geographies, North America is holding the maximum market shares in the unified monitoring market and is expected to dominate over the forecast period. The high rate of adoption of new technology, and developed IT infrastructure are driving the growth of unified monitoring market in the North America region. Additionally, Asia Pacific is the fastest growing region in the unified monitoring market owing to the adoption of the new technologies across various industry verticals, and rising demand of the highly secured system for the banking and finance sectors and developing IT infrastructure. The report on global unified monitoring market covers segments such as component, deployment type, and industry vertical. On the basis of a component, the sub-markets include solutions and services. On the basis of deployment type, the sub-markets include on-premises and cloud. On the basis of industry vertical, the sub-markets include BFSI, healthcare and life sciences, manufacturing, consumer goods and retail, it and telecommunication, transportation and logistics, and others. The report provides profiles of the companies in the market such as Dynatrace, Zenoss, Opsview, GroundWork Open Source, Fata Informatica, AppDynamics, CA Technologies, and Acronis. The report provides deep insights into the demand forecasts, market trends, and micro and macro indicators. In addition, this report provides insights into the factors that are driving and restraining the growth in this market. Moreover, The IGR-Growth Matrix analysis given in the report brings an insight into the investment areas that existing or new market players can consider. The report provides insights into the market using analytical tools such as Porter's five forces analysis and DRO analysis of unified monitoring market. Moreover, the study highlights current market trends and provides forecast from 2018-2024. We also have highlighted future trends in the market that will affect the demand during the forecast period. Moreover, the competitive analysis given in each regional market brings an insight into the market share of the leading players.